Taking the second metrocable from Santo Domingo over the mountain to Parque Arvi, the landscape turns from urban to rural forests in the blink of an eye. Medellin continues to look for ways to expand Colombia’s only metro system. By all accounts, the metrocable system which extends from the train line up into two different neighborhoods in the city has proven a success. In 2009, I rode on Line K, which extends from Acevedo to Santo Domingo where Biblioteca Espana was built, twice. Santo Domingo offers sweeping views of Medellin in the valley below, and for the cost of a metro ticket from anywhere in the city, it’s a real steal. The newly constructed terminus of the Line L metrocable in Parque Arvi. 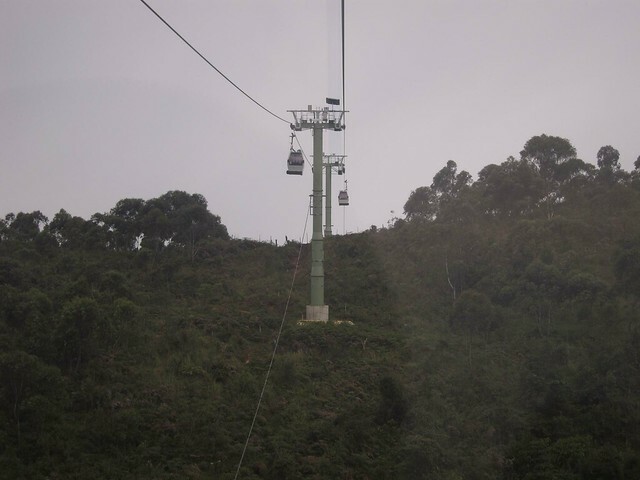 Since then, a separate metrocable, Link L, has been built from Santo Domingo up over the mountain ridge, to Parque Arvi. One Friday, I went to explore this new territory with a friend. Unfortunately, the trip took longer than I expected, so starting in the early afternoon, say around 1 pm, offered us very little time in the park. A normal metro ticket currently runs 1,550 pesos ($0.86), and that will get you as far as Santo Domingo, at which point you exact Line K, and transfer over to Line L.
You are required to buy a new ticket, which is slightly more expensive at 2,500 pesos ($1.39), however I believe it covers your return trip back to the regular metro line as long as you do not exit the metrocable station(s) when making the transfer on the way back. The road from the metrocable to the entrance of Piedras Blancas park. The ride from Santo Domingo to Parque Arvi is a completely different experience. Instead of drifting over homes and neighborhoods, you’re above a forest. It takes about 10-15 minutes to arrive at the terminus, so hopefully you’re riding with friendly people in the gondola. Upon exiting the metro, you’ll see a tent with a few people giving out information and maps. They’ll be able to point you in the right direction, depending on what you want to see. My friends Troy and Christine walked to a small waterfall, while on my visit, I headed for Piedras Blancas, a hotel and park within the park. It required a short walk down a road. Facilities at the park are still under construction. The photo above shows the point at which if you turn to your left, you’ll see the photo below, which is the entrance to Piedras Blancas. 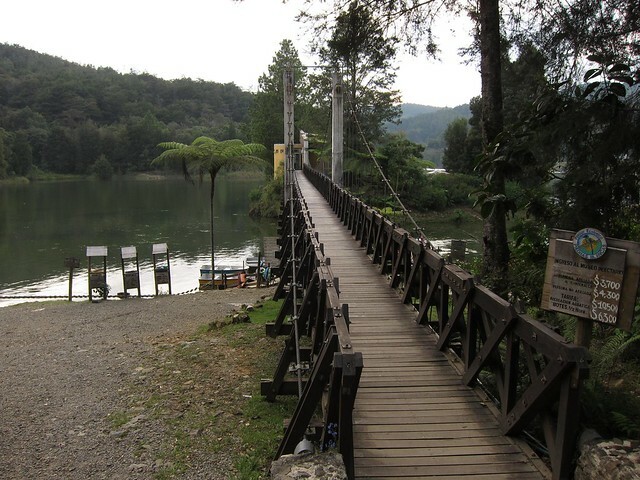 At that point, it’s about a one hour walk along the road to reach the lake and nature trails, so it’s best to either take a horse (about 5,000 pesos) or better yet, one of the buses that pass by on the way to/from the nearby pueblo, Santa Elena. 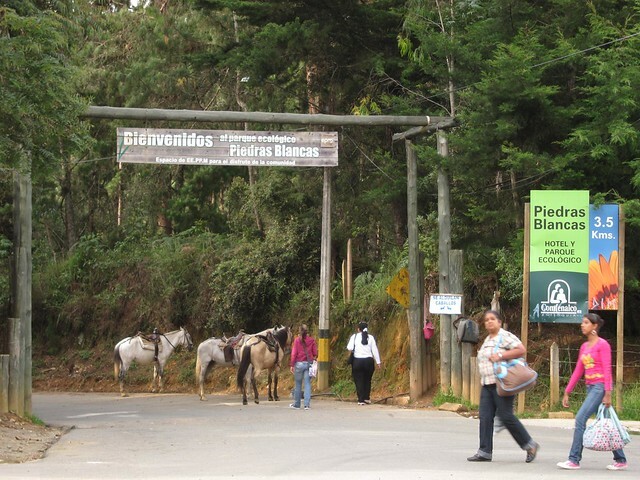 The entrance to Piedras Blancas where visitors can take either a bus or horse to the lake and nature paths. After waiting about 15 minutes for a bus, to no avail (because it was a Friday afternoon and they were running less frequently), we started to walk. I figured the guy renting horses was fibbing when he said it was a one hour walk, but as we headed down the road, I started to realize he was telling the truth. Luckily, a bus (1,000 pesos) eventually came by and we waved it down. Once on the little bus, it was evident the walk would indeed be an hour, at least. We hopped off the bus at the entrance to Piedras Blancas, and as it was so late in the day (and close to closing time), we were allowed to enter for free. A series of walking trails wrap around the lake, and there are signs posted which detail the local wildlife and fauna. Paddleboats are available for hire, and there is an Insect Museum, among other sites, for the curious. View of the lake, with the park’s hotel perched on a hill above. A hotel is perched above the lake, and from the look of the photos in a brochure back near the metro, it looked like a swanky place to stay. I immediately pictured it as a great place to take a partner for a Saturday night getaway, or to celebrate an anniversary. 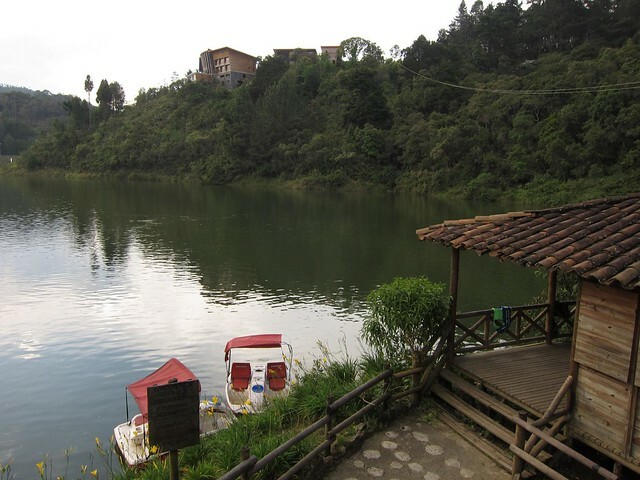 Unlike bigger pueblos like Guatape and El Penol, there was very little traffic on the roads within the parks, and while I’m sure it’s busier on the weekends, especially with sunny weather, I still picture it as a very tranquil getaway from the busyness of Medellin. The last metrocable going back to Santo Domingo is around 6 pm, and we managed to catch a ride in a park pick-up truck (1,500 pesos) to ensure we got back in time. 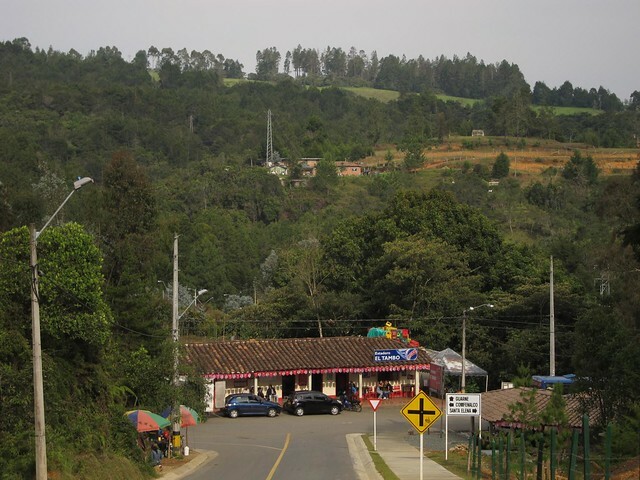 The alternative would’ve been a circuitous route via bus back through Santa Elena to Medellin. Hey Andrew — definitely worth a visit. As my friend Troy said, there aren’t a lot of cities where you can take the metro to a campground for a night/weekend. Looks great. A few questions. What’s the budget for a whole day there, roughly? What time does it open and what’s the time to leave Medallo, say from Acevedo, in order to get there just when it opens (and maximize the day)? 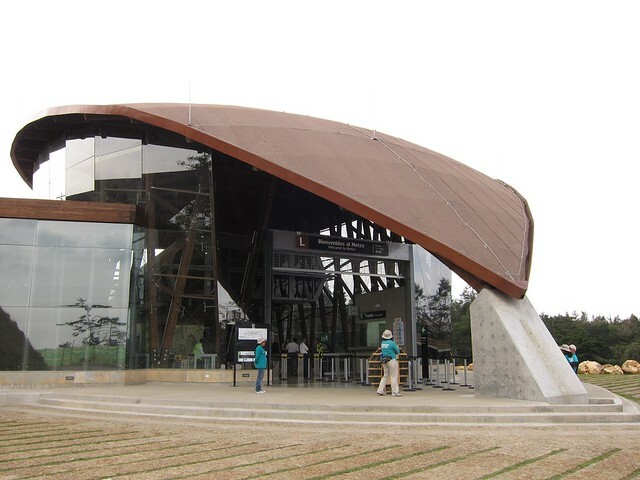 I took the cable car up to Santo Domingo when I first arrived in Medellin. It was truly fantastic experience and you just pay for a normal metro ticket (about $1). The best part for me is seeing the people, housing and general way of life below. Totally another world from from where I was staying in Laureles at the time – the contrast was incredible. You should be fine walking between the metrocable station and Biblioteca Espana during the day. I’ve done it a few times over the years, though always with a friend. There’s usually security guards around. Did I miss where on here it mentions which metro station I connect from?